Good Morning, & Happy Friday! 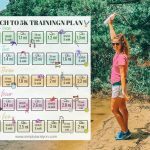 I wanted to stop and blog a recipe I made last weekend before my crazy day starts. I have so much going on today/this weekend. More about that Monday (in the recap post.) I’ve been eating a delicious crockpot soup all week long. There’s nothing better than warming up to a delicious soup at the end of the night, especially a healthy one that is filled with protein and vegetables. I was excited to break out the crockpot because it had been way too hot to even think about soup the past four months. Now, the evenings and mornings are in the low fifties! Finally. For the past four years, I’ve been making vegetable soup. 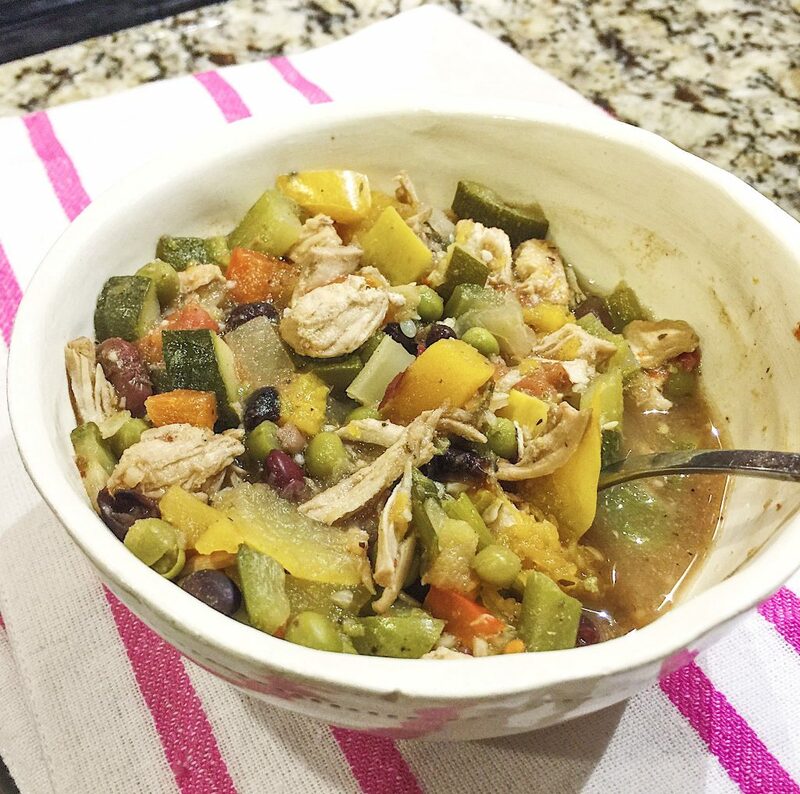 My minestrone has been a favorite on the blog, and I still receive photos from people who have been making it. That always makes me happy to see! Today’s recipe is similar, but it has the addition of butternut squash, chicken, and more spices! I think this one is my favorite so far. 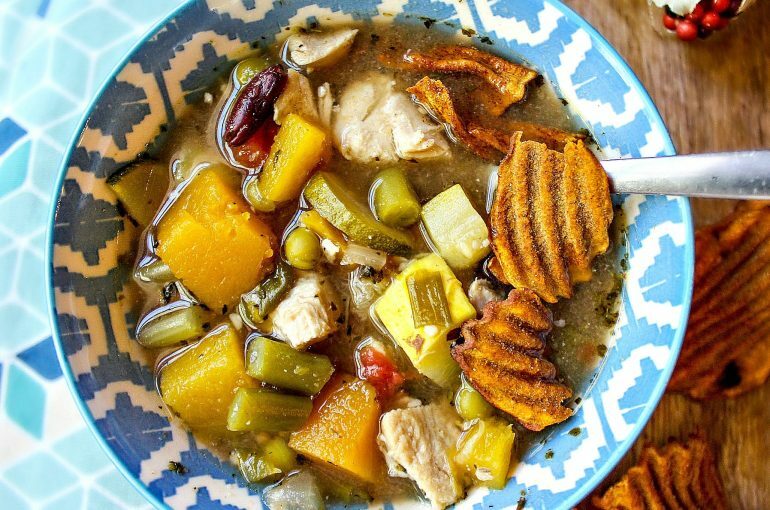 Who doesn’t love a healthy soup that you can have multiple bowls of without all the guilt? Leo was feeling extra cozy while I chopped vegetables in the kitchen. 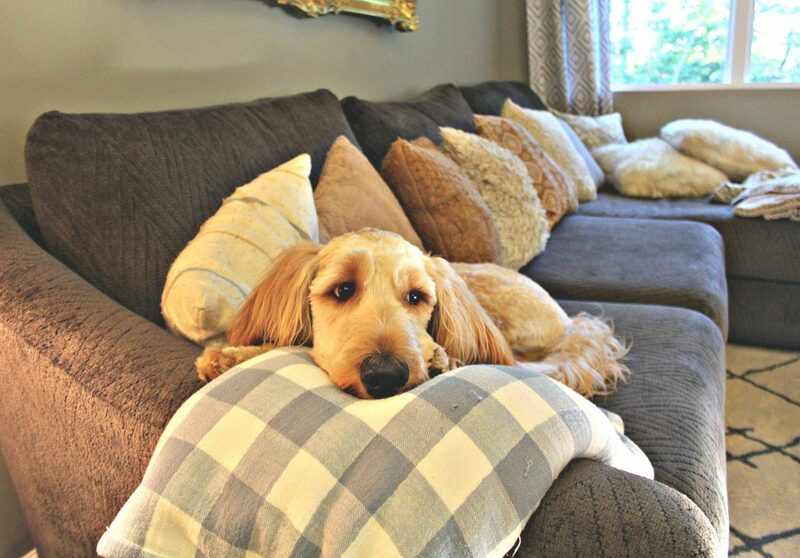 This is his favorite spot to sit and watch me. We call it his “begging” platform. 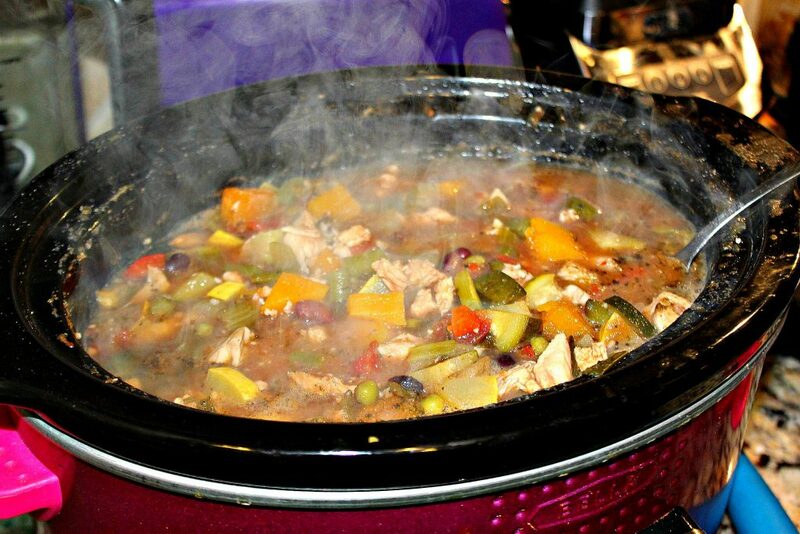 Crockpot Vegetable Chicken Soup With Butternut Squash & Beans! Prepare your vegetables! 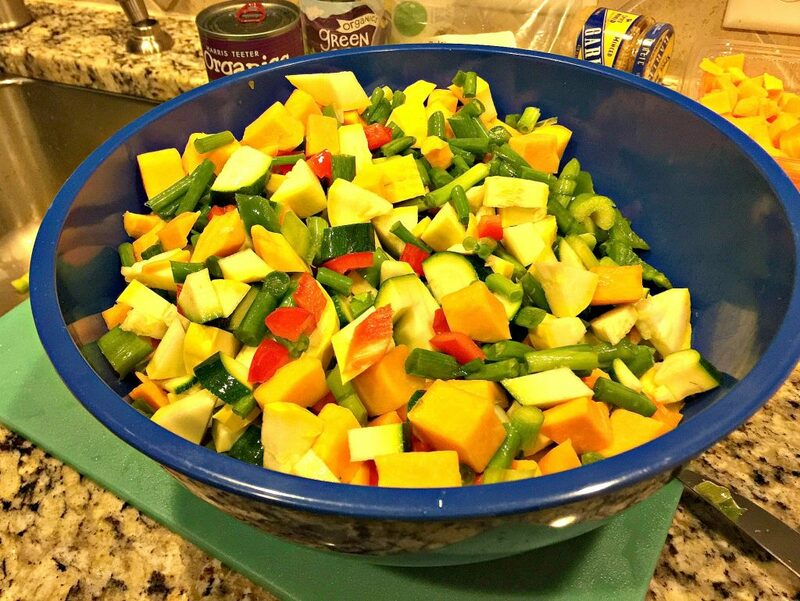 Chop the onion, celery, bell peppers, squash, green beans, celery. 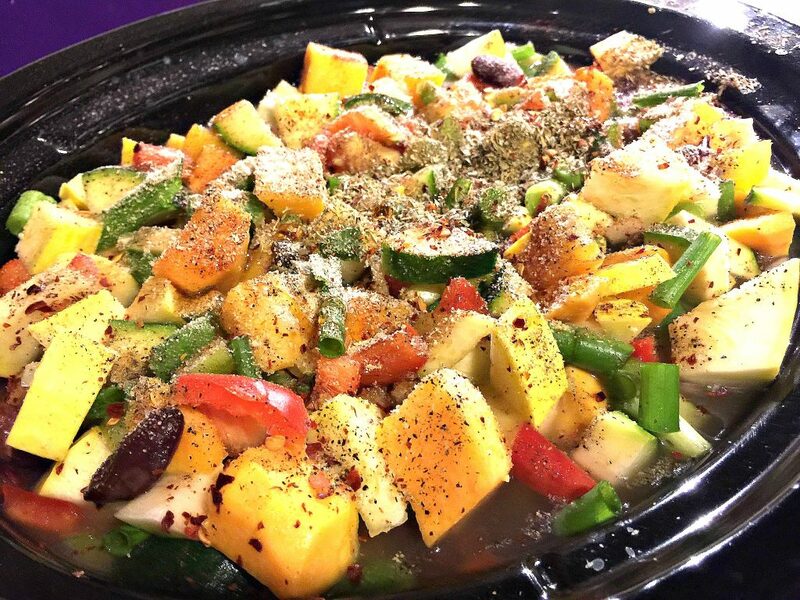 Add vegetables to the crockpot with the chicken broth. Turn pot to high. Drain the canned peas and beans. Add them to the crockpot. Add the undrained can of tomatoes to the crockpot. Add in all of the seasonings and minced garlic. Let the soup cook for five hours on high. Stir every hour or two to allow the soup to cook evenly. Dice chicken, Add the chicken to a pot of boiling water. Boil chicken until semi-cooked. Drain, and add semi-cooked chicken to the crockpot. **Boiling the chicken first makes the soup less "fatty" - Tip from grandma! Cook soup on high for another three hours. *you don't want to add the chicken in too soon, or it'll become overcooked and dry. 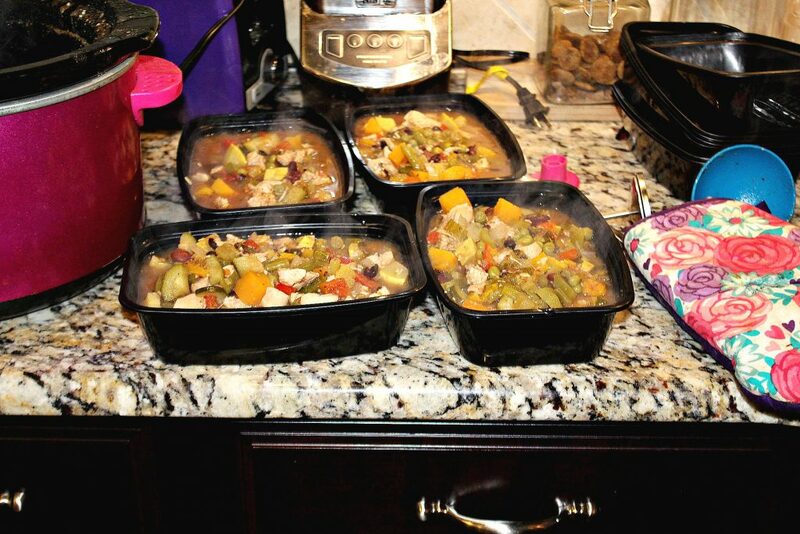 Once the soup is done, give it a taste test and determine if it needs more seasonings! I always end up adding extra splashes of garlic, salt, or pepper! Turn the pot to warm. Serve! I stored some in the freezer and some in the fridge! It's even better the next day. I love this soup because you can find these ingredients almost all winter long at nearly any grocery store around you! This soup is so flavorful! You’ll have to bring out your inner chef and use your taste buds to make it fit your standards. Some people like more garlic, or less! More spice, or no spice! Have fun and play with it. Add potatoes! Pasta! Or anything extra! 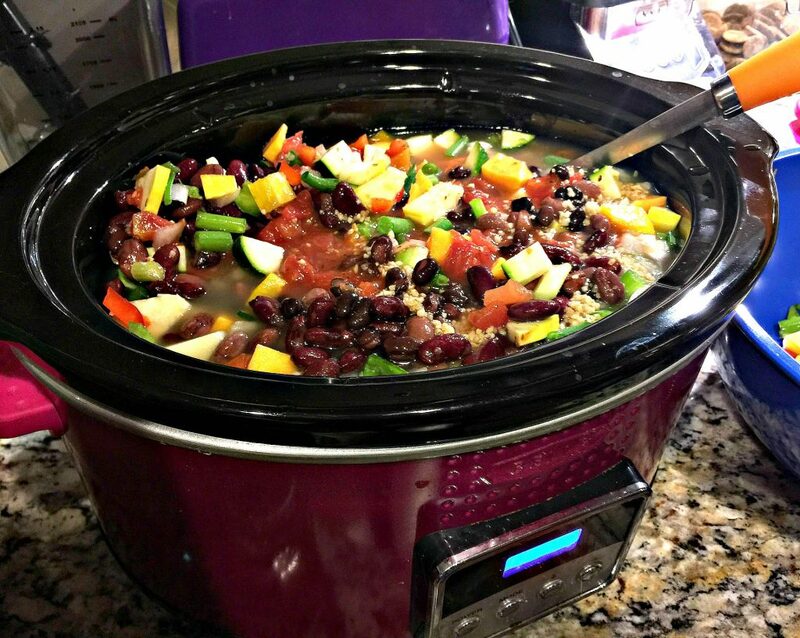 The great thing about this crockpot soup is that you can prepare it in the morning, and have it ready by evening. My favorite part? Freezing the leftovers for meal prep! Perfect for the nights I don’t feel like cooking. I always take Kyle’s meal prepping containers. They are reusable, washer safe, microwave safe, and so freaking convenient! You can get them pretty cheap on Amazon! This is a pack of 20 for under $20. Link here. I found these Pumpkin Spice Sweet Potato Chips at the grocery store, and I thought it would be fun to add them to the soup! There is nothing better than adding a little sweet to your savory meals. I usually add croutons, but this looked so fun! & Holy moly, what a tasty addition! 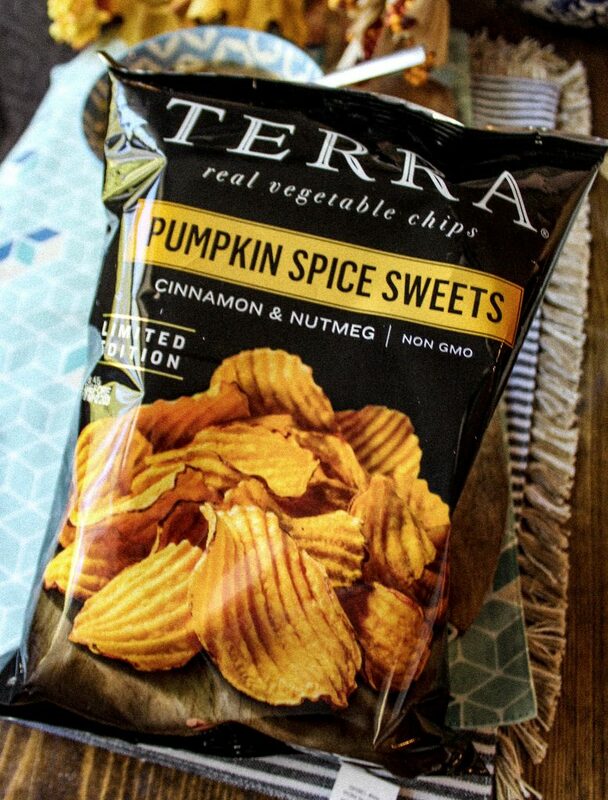 By the way, these Terra chips are incredible! I loved the chunky butternut squash in the soup. I think next time I’ll add even more. It brings to much “fall” to the dish, and I love the potato-like texture. The soup is perfect by itself, or paired with a salad! 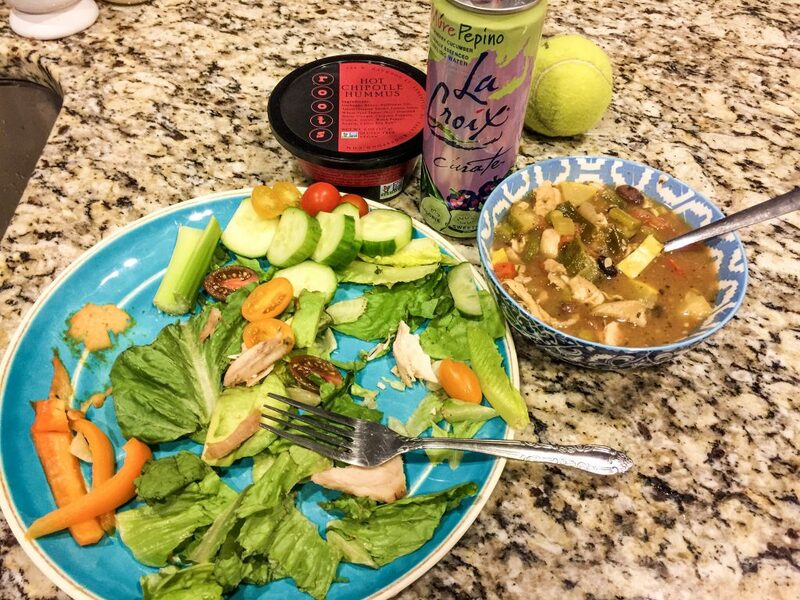 Soup & salad are pretty much BFFS. This soup is gluten free, dairy free, nut free! 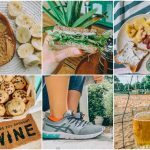 Want to make it vegetarian/vegan? Use vegetable broth! Omit the chicken & add tofu! 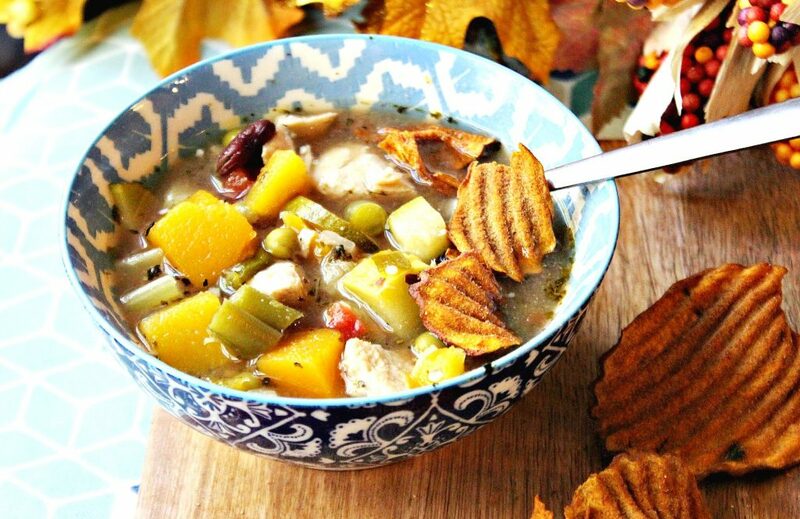 Have you made anything in the crockpot this Fall yet? What soup would you like me to make next? Made this today and it is phenomenal! There is an amazing depth of flavor and a wonderful smell filling my apartment. Thank you for sharing such an amazing fall recipe! Oh yay! 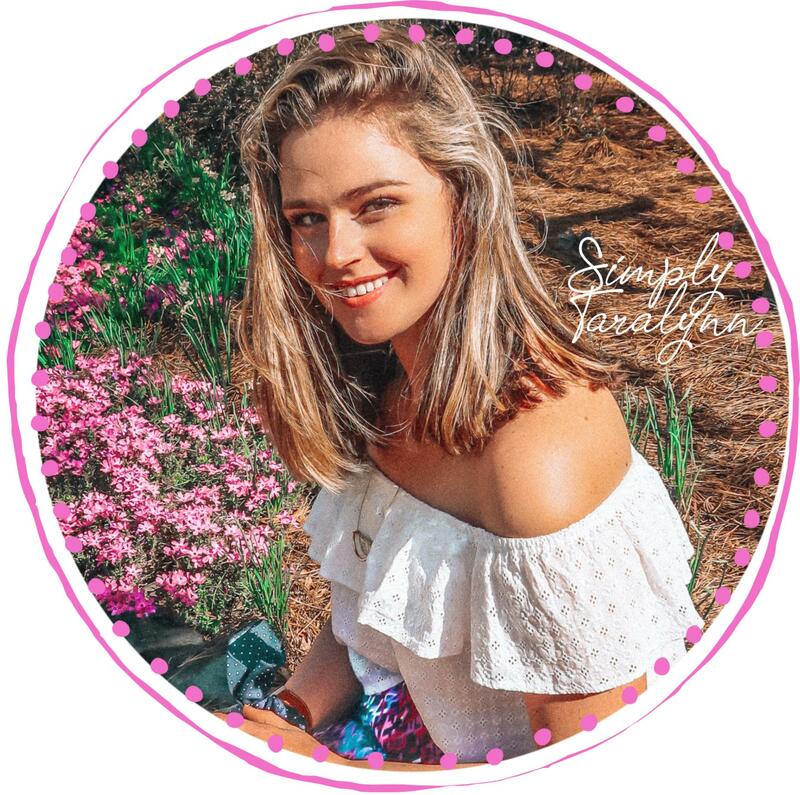 Thanks for sharing, Katie! Glad you enjoyed!!! This soup was so insanely good we fought over it 😂But seriously this was literally the best soup I ever had. Yay!!!!! I’m so happy to hear that. I made two batches and froze them! We’ve been eating them all month!! One of my favorite things to throw in the crock pot is either chicken breasts or a pork shoulder with Trader Joe’s salsa verde, its great for adding the meal to tacos, salad or enchiladas. Also chili is my other go to. I think you should try a chili or maybe a pumpkin soup, my mom makes a great one that she learned from my french grandmother. And finally the candy question I say anything chocolate like a mixed bag or those caramel apple pops! Those are delicious! Made this after feeling a cold coming on this weekend. It was really good! Love the soup! The veggies in the soup looks amazing! I’m not a fan of minestrone soup, but I might try this. I need to meal prep too. Can i add sweet potatoes? i cant find squash. This soup sounds delicious! Another recipe (the zucchini bread) that I cannot wait to make! I have only made fajita chicken tacos using the crockpot, but nothing “fall” yet! 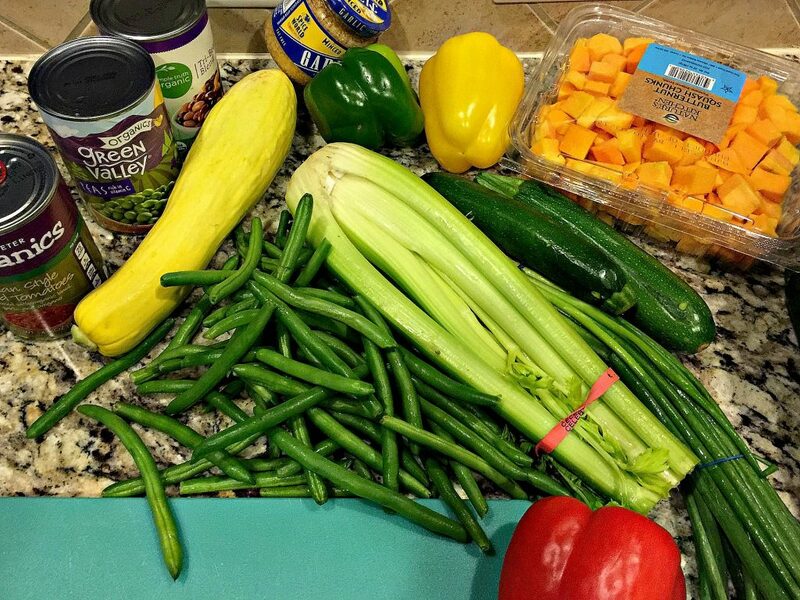 Chili certainly is on the list to make shortly, as well as your chicken vegetable soup! 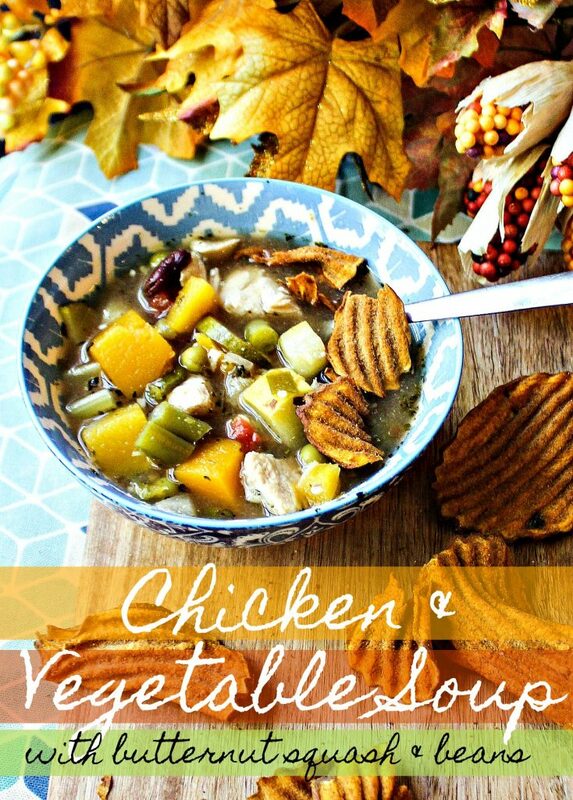 Not usually a soup person, but again, the vegetable chicken soup looks pretty perfect! Maybe a lentil & sweet potato soup? One year I handed out Annie’s organic gummy fruit snacks – maybe Earth Fare or Whole Foods has something similar in bulk? Fajita chicken tacos are so good! I would probably eat all the fruit snacks! I love the idea of adding butternut squash instead of sweet potatoes. It was really good, too! Peas are so good in soup. Have you ever added fennel? It’s not cold yet here in Florida, but I think I’m still going to make a batch of this. It sounds delicious!! Love the idea to pair it with a salad for an easy lunch at work. Yum! Thank you for sharing! Thanks for the recipe, Taralynn! I bought all the ingredients after work yesterday evening and I will be making it today! Can’t wait to watch it during the football games. I’ve made chicken with fennel, tomatoes and bacon, served on polenta the first time and I froze the rest for on pasta later and cooked a bunch of apples. I love cooked apples in smoothies! Tortilla! I’d like to read your spin on it. Wow. I’ve never heard of anything like that before!! Lol always a good treat! This sounds delicious!!! We broke out he crock pot to make ribs recently but I’m feeling the need to make chili soon. I won’t complain about soup anytime of the year though! Chili sounds like something I need to make soon!! It’s my favorite right now too! Happy Friday! This looks absolutely amazing. I bought a vegetable soup from Whole Foods last week and looked forward to coming home to a warm bowl after work a couple nights this past week. I made a Cheeseburger Soup in the crockpot a couple weeks back when Chicago got their first sightings at cool temps. It’s an old Weight Watchers recipe and we serve it with blue corn tortilla chips or a warm pretzel roll. My next suggestion for soup is tomato bisque! My favorites to hand out are Take 5s (lol it has the pretzels IN it) or Snickers!! Whole Foods has pretty good soup!! Cheeseburger soup? Wuhhh. That sounds incredible!!! Tomato bisque is a great idea!! I have not made anything in the Crockpot yet this fall. I would love a creamy tomato soup! I am not sure about candy. We always get a variety. I need to come up with a fun tomato soup recipe! I haven’t been able to stop eating butternut squash lately, so I’m loving this recipe!